Indeed, after years of waiting, Avatar 2, and the additional three sequels James Cameron has planned, are well underway. But much work still needs to be done. We heard that production had wrapped on the movies in November, but that was just for the extensive motion capture performances. Now, we have word that live-action filming for the long-awaited sequels is set to begin this spring in New Zealand. This latest update comes from producer Jon Landau, who has been promoting Alita: Battle Angel, which he and James Cameron are producing. During a recent interview, Landau provided an update on where Avatar 2 and the other sequels stand, revealing that they're gearing up for live-action production in the coming months, with Edie Falco (Nurse Jackie) having recently joined the cast. Here's what he had to say about it. "We have completed our principal capture on Avatar 2, 3, and part of 4. We're going to do our live-action filming in New Zealand in the spring of this year. We just announced today that we've cast Edie Falco to play General Ardmore, who is the head of the RDA forces. In typical Jim [Cameron] fashion he finds this powerful woman to play what could be very easily a male role if people were just to read the script." 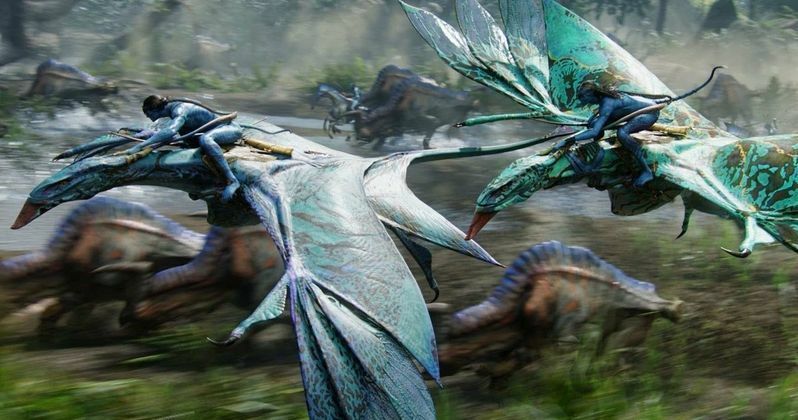 It's a little unclear if they're going to film all of the live-action sequences needed for just Avatar 2, or if they're going to dive a little deeper and complete work for 3 and 4 as well. For the time being, it seems like they're holding off on 5 until they can see if the appetite is going to be there from the audience. Jon Landau also confirmed that much of the long delay between the first movie, which was released in 2009, and its sequel had to do with the writing process. They insisted on having all five scripts done before entering production. "That's what we waited for. We needed to have all the scripts done before we embarked on production. We needed to understand where the characters were going. Not only did we need to understand it, our cast needed to understand it. Our cast playing these roles needed to understand decisions they were making in movies 2 and 3, how it would affect them in movie 4. Because if they didn't, they might not bring the same thing to it. So we waited to complete all four scripts before we ever embarked on doing the project." Disney is closing in on their merger with Fox, which is expected to be done by June. That means it will be Disney in control of Avatar 2 and the rest of the sequels and, as long as they're making money, it seems highly probable that the Mouse House will press forward with James Cameron's plan. Currently, the movies are set to be released on December 18, 2020, December 17, 2021, December 20, 2024, and December 19, 2025. Though, that could be subject to change. This news was first reported by Collider.